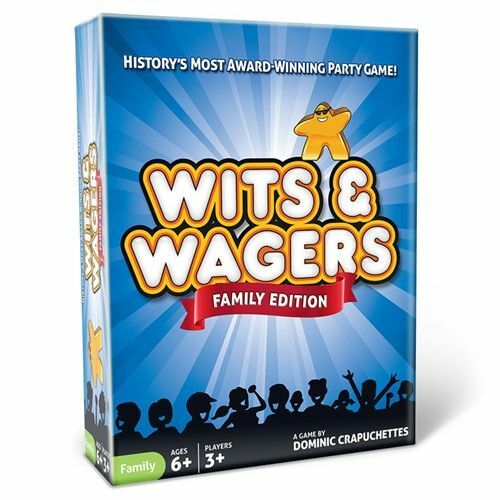 Wits and Wagers Family brings history’s most award-winning party game to the entire family! Now, the parents are finally the underdogs! Do you know the average number of times a person blinks each day? Of course not – and you don’t need to! That’s the fun. No one knows the answer. Take a guess and score points by choosing whose guess is closest. With easy rules and exciting game play, Wits and Wagers Family will get the whole family cheering and laughing together. Contents: 125 question cards,5 dry-erase pens, 5 dry-erase answer boards, 1 “1” answer board, 5 large Meeples, 5 small Meeples, 1 dry-erase score board, 1 full color rules.